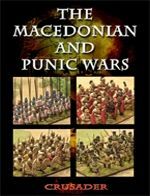 The Macedonian and Punic Wars supplement for the Crusader Ancient and Medieval rules. The supplement is a full colour 52 page, perfect bound A4 book in the same style as the original rules. There are sections that cover the history, armies, troops and campaigns as well as army lists for the main protagonists plus mercenaries and allies.